For over 60 years we’ve worked with shops worldwide, providing robustly built panel saws, compact edgebanders and vertical CNC routers. Serving the woodworking, glass, plastic and building enclosure industries, our Italian-made machinery are built to UL/CSA norms and have US-based support through our nationwide network of knowledgeable dealers and trained technicians. Putsch® maintains a robust inventory of machines and OEM spare parts in both North Carolina and California for faster delivery and service. 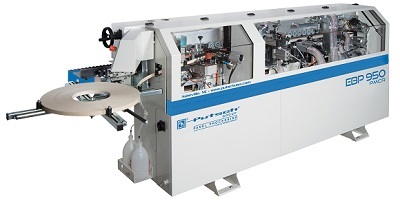 Putsch® SVP Series Vertical Panel Saws save space, are safe to operate and produce cuts accurate to .004th of an inch. Built using a monolithic steel frame and available in a variety of models and configurations, Putsch® SVP Series vertical panel saws offer commercial quality sizing of all panel materials including melamine, solid surface, plastic, ACM, wood and even multi-laminate glass. All models are available with automatic shifting grids, UL/CSA registered motors and choice of manual or automatic saw travel. Our Italian-made Putsch® EBP Series Compact Edgebanders are very easy to integrate into any workshop with a space-efficient design that is attractively priced. Built on a robust steel base, Putsch® EBP Series Edgebanders offer years of quality production with user-friendly operator controls and maintenance. The Putsch® Vantage is available with either front or rear loading along with either 10-, 12- or 14-foot carriage runs. Cut single or stacked sheets with confidence as the Vantage comes equipped with variable height blade projection up to 95mm with an independent ascent scoring system. Using a Windows-based user interface, the controls easily integrate with any legacy desktop optimization program with on-board optimization available. Ideal for the building enclosure, plastics and aerospace industries, the Putsch® Alucenter CNC Center’s vertical design offers ergonomic loading/unloading while adhering to our philosophy of space-saving design. Built in a state-of-the-art factory in Poggibonsi, Italy, the Alucenter is available with a standard 5 ft. x 12 ft. table, 10-position tool holder, light barrier enclosure and Windows-based operator tower. The Putsch® SVP 1080 Automatic Vertical Glass Saw is uniquely designed to cut thick glass such as bulletproof, fire-rated, soundproof and other multi-laminated materials. Using a 350mm diamond blade, the wet-cut SVP 1080 is the best way to cut 10mm to 70mm glass accurately and minimize water exposure on the glass edge for better product yield and reduced risk of delamination or reaction. 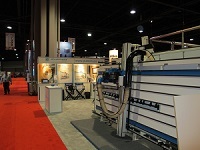 Putsch® Panel Processing will be showcasing their SVP Series Vertical Panel Saws and EBP Series Edgebanders at the International Woodworking Fair in Atlanta, GA on August 22-25. Visit us at Booth #7913. Putsch® Group serves every customer and dealer in North America from our technical center in beautiful Asheville, NC where we warehouse ready-to-ship machines and OEM spare parts. For information, pricing or to locate a local, authorized and trained Putsch® dealer, call us at 828-684-0671 or email us at info@putschusa.com.